"We believe that this ability is on the path to machine self-awareness." 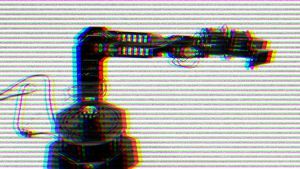 Researchers at Columbia University say they’ve built a robot arm that can construct a self-image from scratch — a capability they frame, provocatively, as a step toward machines that are truly self-aware. The robot arm, described in a new paper in the journal Science Robotics, learns how to operate by experimenting — with no programming about physics, geometry or its own construction. But after a flailing around process the researchers call “babbling” and a period of “intensive computing,” the arm’s algorithm starts to make sense of the world. After its self-discovery process, according to the researchers, it managed to handle complex situations including repairing itself and writing text with a marker. Those accomplishments are impressive, but the arm is a long way from writing a poem. Still, Lipson frames the project as an important step toward understanding how humans learn to conceive of themselves — and perhaps one day building robots that understand themselves as we do.